Fullness of Joy Floral is a family owned business, located west of Port Angeles, Washington off of Highway 112. We took over Angel Crest Gardens which had been in operation since 1998. Our hearts are thankful for this new adventure. We offer flowers for all occasions! Weddings, banquets, delivered arrangements, funerals, birthdays and much more! We are in the process of getting a few U-Serve roadside stands on the farm entrance and located in west/east Port Angeles up and running. 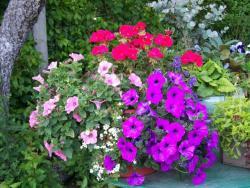 At the moment we are filling the green houses with hanging baskets, porch pots, decorative baskets and succulents. We still have the cutting field from which we gather blossoms for our bouquets, weddings, and special occasions.